In 2008, veterinarians at Tufts University Hospital for Large Animals conducted a survey of horse owners. A total of 67 people who brought their horses to the facility for treatment answered general equine management questions, as well as four designed to gauge their understanding of proper equine feeding practices. The results were unsettling: Less than half of the owners knew the daily hay requirements for an average horse, and 69 percent were mistaken about the proper role of complete concentrates in the equine diet. To help ensure your horse’s diet is formulated based on the most up-to-date information available, we’ve laid to rest the top seven horse-feeding myths. Armed with the truth, you can do best by your horses when mealtime rolls around. Myth 1: Concentrates or grain form the foundation of a horse’s diet; hay is secondary. This might be one of the biggest misconceptions out there about feeding horses. Ideally, a horse’s diet will be structured around hay rather than concentrates or grains. In fact, retired horses and those in light work may do fine on a hay- or pasture-only diet. Concentrated energy feeds are necessary only for hardworking equine athletes, lactating mares and other horses with higher energy demands, or when the hay available does not provide sufficient calories. Nonetheless, in a balanced equine diet, concentrates will never comprise more than half of a total ration’s weight (“How Much Grain?” page 42). Although individual requirements vary somewhat, most horses do well if they receive about 2 percent of their body weight in forage per day. Excess intake of concentrates and grain can lead to obesity, colic and laminitis. Keep in mind that if you are feeding a “complete” pellet---one that contains roughage---according to the manufacturer’s instructions, your horse gets his daily requirement of forage as part of his concentrate. Although these feeds are helpful for horses who are unable to chew hay or have respiratory conditions aggravated by the dust in hay, they may not be the best choice for horses who do not need them. Not only does munching hay help keep a horse occupied, discouraging stall vices, but the bulk this forage provides helps keep his digestive tract working properly. Myth 2: Bran mashes have a laxative effect and help keep a horse warm. There’s certainly something satisfying about preparing a bran mash for your horse on a chilly winter’s day. There’s also a certain peace of mind that comes with offering a bran-based slurry to a horse who tends to have digestive troubles. What’s more, most horses relish bran mashes. But modern research has shown that these mixtures have no laxative effect and do not prevent colic. Nor do bran mashes offer a lasting “heating” effect for a horse. In fact, overzealous feeding of bran can do more harm than good, because its high phosphorus content can lead to serious mineral imbalances. 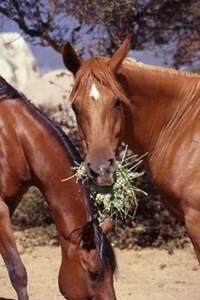 Myth 3: Horses must be fed at the same time every day. Our horses may have helped perpetuate this myth. Anyone who has heard the ruckus horses can kick up five minutes before breakfast is due can be forgiven for thinking feeding times are critical, but in reality they are not. Horses fed at regular intervals are conditioned to expect meals at certain times, but there is no physiological reason to stick to a strict schedule. A horse fed only two meals a day, with restricted forage in between, may be extremely hungry by the time his meal arrives, but he will not be harmed if it’s an hour earlier or later than usual. It’s better, however, to mimic a horse’s natural feeding schedule as closely as possible, by allowing your horse free-choice hay throughout the day. Not only will he more patient if you’re a bit tardy with his dinner, but his gut will function better and his risk of colic and laminitis will be dramatically reduced. Myth 4: Alfalfa is too “rich” to be safely fed to horses. This seems to be a regional myth: Many horses in Western states happily and safely eat the very alfalfa that some East Coast horse owners are afraid to include in equine rations. Alfalfa does contain more protein, digestible energy and calcium0 than grass hays, but it is usually lower in soluble0 sugars. Its reputation for being “rich” may stem from the highly nutritious leaves, which are more digestible than most hays and can contribute to gastrointestinal upset and even colic if introduced too quickly into a horse’s diet.It’s wise to gradually introduce alfalfa hay to your horse’s diet, just as you would acclimate him to lush pasture grass. Most horses would get obese if fed good quality alfalfa free-choice, so it is usually best fed in limited amounts, supplemented with grass hay that provides adequate “chew time” to ward off boredom. Alfalfa’s higher protein and calcium content do result in increased urine output (and water intake) but are not at all harmful to a healthy horse’s kidneys. In fact, it has been reported that the addition of alfalfa to rations of horses confined to stalls and fed limited amounts of forage actually protects against ulcers, probably due to the buffering effects of the higher protein and calcium. Finally, contrary to popular belief, research has shown that alfalfa will not cause, and may actually prevent, developmental orthopedic disorders, such as osteochondritis dissecans in young horses. Myth 5: Weight issues, such as being too skinny or fat, are solely related to how a horse is fed. It’s easy to look to a horse’s ration to explain weight gain or loss, and often that’s where you’ll find the answers. But sometimes a horse’s weight problem isn’t directly related to his feed ration. A horse who is too thin, for example, may have dental problems that prevent him from chewing his food properly. In addition, parasite loads or systemic illness can cause a horse to lose weight even if he is receiving adequate amounts of quality feed. Anytime a horse has trouble holding weight, a complete veterinary exam is needed to determine the cause. Likewise, an obese horse is obviously being fed more calories than he needs, but simply cutting back his ration is only part of the solution. Some horses have a so-called thrifty gene which allows them to “live on air” and gain weight even on sparse, forage-only diets. They may also be more susceptible to metabolic disorders and laminitis. In these cases, the best course is a weight-control program that integrates an exercise regimen---such as active riding four days a week---along with a restricted diet. Myth 6: Corn is a “heating” feed. The misguided notion that feeding corn helps to keep horses physically warm probably stems from how behaviorally “hot” this ration can make some of them. A quart of corn weighs much more than a quart of oats, so owners may unwittingly be supplying a corn-fed horse with many more calories---and energy---than another feed provides in the same volume. Speaking in terms of temperature, however, any metabolic warmth generated by corn is minimal and short-lived. Corn has its place in the equine diet, but a far better “heating” feed for winter months is hay. This fibrous bulk is digested comparatively slowly, and the bacteria in the gut doing that work produce heat for a longer period of time. Myth 7: Letting a hot horse drink cold water is dangerous. Although this myth isn’t strictly about feeding, it is so persistent and potentially damaging that it’s worth debunking as often as possible. Research has repeatedly shown that a hot, sweaty horse who drinks cold water is not at a greater risk of colic, cramping or laminitis. How this myth arose isn’t clear, but one expert postulates that years ago, before the physiological effects of exhaustion were fully understood, water intake may have been blamed for laminitis or colic in horses who were simply overworked. Withholding water can lead to dangerous dehydration. In fact, it’s best to allow your horse to drink when he is at his most thirsty, which is probably right after his workout. Waiting until he is “cool” may result in him drinking less, even if he is dehydrated. This article originally appeared in EQUUS Magazine.